Road deaths are down this year, but gardaí said they will not be complacent in the run up to Christmas. GARDAÍ HAVE ARRESTED 7,428 people on suspicion of driving under the influence so far this year. The figures were revealed as the Road Safety Authority (RSA) and An Garda Síochána launched their Christmas road safety appeal, highlighting the impact of drink driving in the run up to Christmas. Alcohol was a factor in two in five fatal crashes in November and December over the last eight years, with the highest numbers in Dublin, Cork and Galway. Almost half of those killed in crashes during this period are drivers. Speaking today, Assistant Commissioner Michael Finn said 14 people had been arrested for drink driving on Christmas Day last year and 50 were arrested on New Years Day. He also discouraged people from driving to work the day after Christmas parties and warned there will be garda checkpoints in operation early in the morning as well as late at night. According to the RSA, over the last eight years in November and December, 11% of fatal collisions in which a driver had consumed alcohol occurred between the hours of 7am and 11am. Finn stressed that the overtime ban in place for gardaí until Monday will not impact on planned road traffic enforcement operations over this weekend. 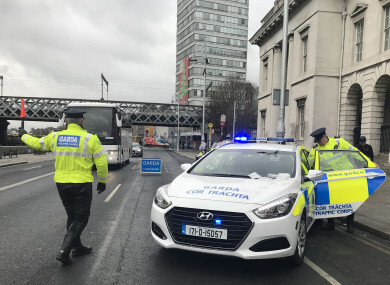 Although there have been 26 fewer road deaths this year compared to this time last year, the Assistant Commissioner said gardaí will not be complacent. “Already this year over 143 people have lost their lives on the road. If you just reflect and think of the impact of that on the families, on the community – it’s staggering, it’s frightening and we cannot tolerate it and we have to make every effort we possibly can to continue to reduce the number of deaths on our roads,” he said. Professor Denis Cusack, director of the Medical Bureau of Road Safety, said legislation and enforcement can only do so much – people need to take responsibility for their actions. “The people who, through their stupidity and foolishness, drink and drive and end up killing somebody, most of those people do actually suffer with terrible guilt and remorse. And we say to drivers: Do you want to be that driver who’s going to live with that guilt, remorse and knowing that you have actually killed somebody or injured somebody and what you’ve done to their family?” he said. We’re all human beings, sometimes we make silly mistakes, that’s really what we say – don’t make those mistakes. You’re going to regret it for the rest of your life and by God the family of the person you’ve killed or injured is going to regret it also. “Everybody here, we’re all part of families, we don’t want to see anybody killed or injured, that’s what it’s all about,” Cusack said. Assistant Commissioner Finn urged people to intervene if they believe someone they know intends to drive while under the influence. He advised people to “gift a lift” to friends and family, by either offering to pick up someone who has been drinking or paying for their taxi home. Email “Gardaí tell people to 'gift a lift' this Christmas as drink driving arrests increase ”. Feedback on “Gardaí tell people to 'gift a lift' this Christmas as drink driving arrests increase ”.